Questions about LEGOLAND Hotel, LEGOLAND Castle Hotel, or our partner hotels? What are the bathroom layouts in the LEGOLAND Castle Hotel? Do you have a hotel accessibility guide? Can I book an ADA accessible room? Do you allow service animals into your Hotels? Do you allow emotional support animals into your hotels? Do you offer special discounts for groups at the LEGOLAND California Hotel? 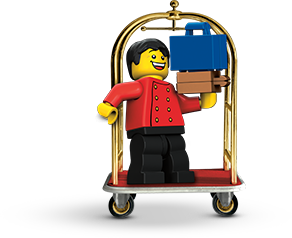 Do you offer special discounts for groups at the LEGOLAND Castle Hotel? Why would I book a group into the LEGOLAND California Hotel?